Del 12 al 16 de febrero en el Instituto de Investigaciones Filosóficas. 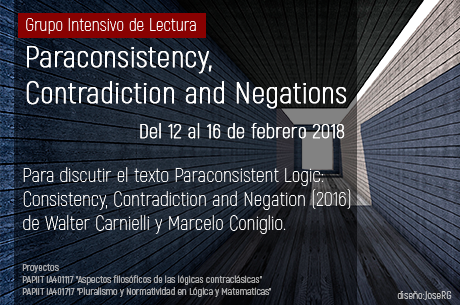 Para discutir el texto Paraconsistent Logic: Consistency, Contradiction and Negation (2016) de Walter Carnielli y Marcelo Coniglio. Cap. 1 "Contradiction and (in)Consistency"
Cap. 2 "A Basic Logic of Formal Inconsistency: mbC"
Cap. 5 "LFIs Based on Other Logics"
Cap. 8 "Paraconsistent Set Theory"
Cap. 9 "Paraconsistency and Philosophy of Science: Foundations and Perspectives"